About to order the Nomad and have been studying cutters. I was wondering if anyone had ideas on the cutters on Ebay from China for practice. They’re very cheap and I’m sure they are junk. But what about for practicing? Any thoughts? I’ll be doing a lot of small detail and engraving work in metal. Any suggestions? In general the “cheap” cutters just don’t last. With that being said some of the guys have had great success using the less expensive cutters including myself. I did purchase the cheaper ones for practising and getting use to my machine but most of that time was spent on wood. Good luck and congrats on your new Nomad. 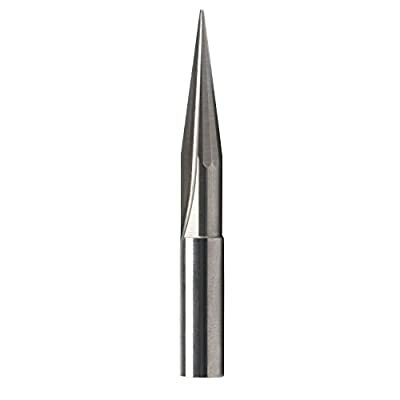 Agree w/ @Bjohnes — some cheap endmills for initially getting started and practice are a good idea, esp. if one wants to use 1/8" ones (EDIT: in scrap/soft materials as @MrBeaver noted below) — that said, the Nomad eliminates quite a bit of the danger to new endmills, so feel free to enjoy using nice ones! At the same time, as you’re learning speed/feed it is nice to know that wasn’t a $20 end mill you just jammed into the work at mach 5 and snapped off (whether it’s a cheap or expensive tool, you’re still going to ruin the work, and snap off the end mill). They’re cheap, you just need to be willing to throw them in the scrap carbide bin and start with a fresh one. I really don’t think they make that much difference in wood and plastic. Metal is a totally different story, but I wouldn’t suggest starting with aluminum as “practice material” for the first project you try. I’ve never seen it mentioned here, but why not use high speed steel cutters? They are a lot less brittle and I imagine for a lot of jobs carbide provides no real benefit. Also, for practice, 1/4" shank endmills are much much more forgiving. I understand the torque limitations of the Nomad are prohibitive, but I use them successfully on plastics. Another thing I’m experimenting with are radiused cutters. They are much less likely to chip while plunging. HSS is surprisingly hard to find in 1/8". The nomad comes with a 1/8 collet only. You can get others, but that’s all that is in the box. I’ve gotten a few 1/8" HSS tools myself recently, and have been meaning to try them on aluminum. The 1/4" tools -are- pretty durable by comparison, but yeah, they’re not real useful on anything but plastic on the nomad. I’ve been able to use them on wood, but it was more hassle than it was worth on the nomad. Yeah, I forgot to mention that I have the 1/4" collet. Most of my HSS tools are Dremel bits-they aren’t exactly endmills (they don’t plunge cut and have like 8 flutes. It would take a lot of experimenting to come up with usefull feeds and speeds. I’m still looking into some other spindle option to solve the torque problem. Makerdreams uses a 300 watt RC motor without closed-loop speed control and Othermill has a new high speed spindle, so I know it’s possible. Just haven’t gotten around to trying it. I’ve also thought about using a flex shaft to connect a large brushed motor to the Nomad pulley. If I had the room I would probably move up to the Tormach PCNC 440. I happen to live close to Santa Cruz Electronics, their only California showroom and it’s an an awesome real mill. I usually advocate for HSS, really sharp for a finishing pass in materials which benefit from the sharpness of steel, but don’t need the toughness of carbide. This is my latest (cheap chinese) engraving cutter. My other cutters I get from grainger, and I always stick with carbide.